Here in Jazz Appreciation Month, there is news of a short Jazz Road Trip next week for the chance to see a top-notch group. The Anat Cohen Tentet, featuring jazz clarinetist Anat Cohen and a great supporting cast, will perform in the Kennedy Union Ballroom at the University of Dayton on Wednesday, April 11th at 7:30pm. Tickets and more details are available here. The ensemble, under the guidance of musical director Oded Lev-Ari, released their debut album Happy Song this past fall, and the collection is indeed a joyous musical celebration. The live concert will feature the lineup from the CD: James Shipp (vibes/percussion); Rubin Kodheli (cello); Nadje Noordhuis (trumpet/flugelhorn); Nick Finzer (trombone); Owen Broder (baritone sax/bass clarinet); Vitor Gonçalves (piano/accordion); Sheryl Bailey (guitar); Tal Mashiach (bass); and Anthony Pinciotti (drums). Head west next week for swinging good times! Keep reading for previews of entertaining Columbus area shows this week. Friday, April 6th (7:30 – 10pm): Jazz At The MAC: “The Classic Songs of Hollywood” with the Aaron Scott Quartet at the McConnell Arts Center. Drummer Scott has assembled a top-flight quartet for a look at timeless tunes of Tinseltown. The program will feature vocalist Rachel Sepulveda, and the group will be filled out by Mark Rubinstein on piano and Roger Hines on bass. Expect songs made famous by Bing Crosby, Frank Sinatra, Debbie Reynolds, Doris Day, Judy Garland and more. There were still seats available as of press time, so click here NOW to purchase your tickets! Friday, April 6th (8 – 10pm): House Concert with Spin Cycle at Andrews House, Delaware. This Delaware community services center and occasional jazz venue is hosting an exciting touring band from New York City that is playing on the release date of their brand new album! 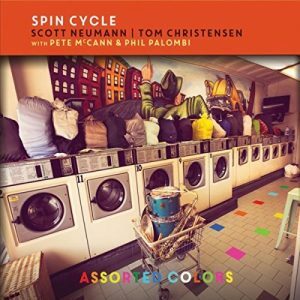 Spin Cycle’s sophomore release Assorted Colors highlights the eclectic approach of the group, which is co-led by saxophonist Tom Christensen and drummer Scott Neumann, and also features guitarist Pete McCann and bassist Phil Palombi. Get ready for “a mix of blues to ballads and punk to funk.” A donation of $15 for adults and $5 for students (kids are free!) is suggested at the door, and a portion of the proceeds will benefit Andrews House. More details are available here. Saturday, April 7th (7 – 9pm): Mark Hampton: ROOTS in Concert at Long Street Studio, Downtown. Bassist Hampton recently reemerged on the Columbus jazz scene with the release of his new album ROOTS – read the JazzColumbus review here. After the well-received release party in February, this concert presents another chance to experience this new music and its powerful story live and in person. Hampton will be joined onstage by the ROOTS Band: Chris Hoyte on tenor, alto and soprano saxophones; Kris “KG” Garner on drums and various percussion; Mark Hampton II “MJ” on keys and guitar; and Professor Larry Collins on percussion. Collins is a Professor of Art at Miami University and is also one of the artists responsible for the artwork on the two bridges in the King-Lincoln District. While Hampton will be holding down the bass, he tells me that he will “step away from the bass for a moment and play a classical intro on one of the songs called ‘Intellect. '” Hampton also says to expect other music not performed at the first ROOTS concert as well as audiovisuals to “enhance the musical experience, making it a multi-sensory concert!” Tickets are available at Hampton’s website.